I wrote this piece several weeks ago for SheWrites, a social networking site for women writers, and it was picked up a few days later by More.com. I’m reprinting it here because I’ve gotten more feedback on it than on any other essay I’ve written. People called it “brutally honest” and “courageously candid”; one writer said she could never imagine being so self-revealing. Another wrote that she burst into tears reading it because my experience was so close to her own. Perhaps because I’ve come through this to some kind of other side, I didn’t worry that I was being too candid — I just wanted to write frankly about my experience. But it’s hard for writers to speak honestly about the difficult times, I think, particularly when they’re ongoing. I agree that it looks easy now – three books in two years is pretty good. But it took a long eight years to get to this point, during which time my confidence was so shaken that I questioned everything about myself as a writer. More than once, I wondered if I would ever publish again. Here’s what happened: In the mid-nineties, after making a small but audible splash in the big pond with my first novel, Sweet Water, my second novel floated quietly on the surface. In truth, Desire Lines did nearly as well as the first, but the publisher’s expectations – and advance – had been much higher. Nobody would quite say it, but I sensed it: the book was a disappointment. I felt like a failure. When Desire Lines came out I was working on a new novel. But my sense of having let people (including myself) down, combined with moving to the suburbs and raising three young children, played havoc with my self-confidence. On top of that, I was writing about the death of a child who was exactly the age of one of my own, and the subsequent dissolution of a marriage. This difficult, painful material, while not specifically autobiographical, cannibalized my own experience in myriad ways and often felt overwhelming. In the middle of all of this, I took on what turned out to be a disastrous ghostwriting project to help pay for that house in the suburbs. Without an adequate contract (or, it must be said, a clear sense of boundaries), the whole thing eventually imploded. I took a full-time teaching job and other works-for-hire to make up the lost income when my kids were 6, 4 and not quite a year old, and at some point, without even quite understanding what was happening, I became completely demoralized. I sunk into what I now recognize as a mild depression. With the help of a therapist and support from my husband, I eventually rallied. My children grew, my teaching job got easier, I acclimated to life in the suburbs. And after four agonizing years, I turned in an unwieldy manuscript. My editor at the time took forever to read it; I didn’t hear anything until one day her assistant called to say that the novel was “in the pipeline,” scheduled to be published in the spring. I was flabbergasted – I knew it wasn’t anywhere near ready. I went to lunch with my editor and she asked what I was working on now, and out of nowhere I summoned a new idea, fully formed, like a movie pitch, about a single woman who meets a guy online and moves to Maine. So I did it. I wrote The Way Life Should Be in a fever of relief after the torment of the other novel. This new book was a lighthearted, humorous, first-person, present-tense story with recipes, and looked nothing like my life. It was a joy to write. Within several years, this new book was published – and I was back on track. (The editor was right; people were eager for a light, funny read.) When I turned back to the old manuscript, I had regained my confidence. I had a new perspective and a new editor who proposed radical structural changes that helped transform the manuscript. And after all that time, I had distance enough to see it clearly. I finally knew exactly what I needed to do. In my eight-year publishing drought, when I feared I might never finish another book and it seemed as if other authors were whizzing merrily by, writing one novel after another, I felt as if I’d blown my chances, fallen out of the race. But what I’ve come to realize – and what may be heartening to others who, like me, take a while to get their act together or go through ebbs and flows – is that when you do eventually publish, the intervening years disappear. The current book is the only thing that counts, and it doesn’t matter how long it took you to get there. So yes, now it all looks easy. But I need to acknowledge just how hard it was, and how long it took, if only to remind myself how important it is not to get caught up in other people’s judgments and my own unrealistic expectations. Ten years after I wrote the first word of Bird in Hand, it is finally being published. During the fallow years, I gained insights into marriage and family life and the complicated choices people make that I didn’t have access to when I was younger. I developed the confidence to write from the perspective of mature characters, including men (which I’d never done before). 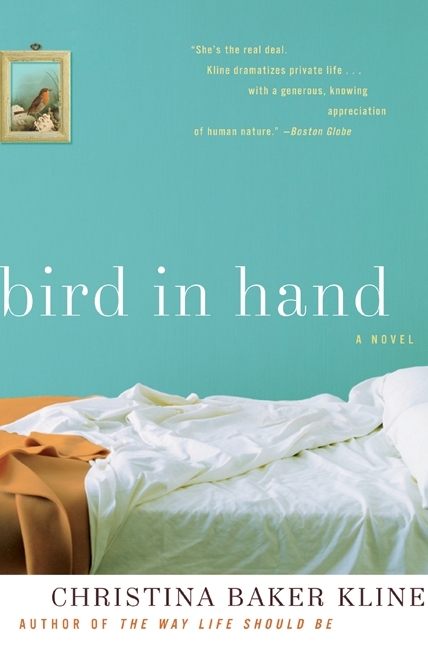 And I think that, perhaps as a result of the many drafts and revisions, Bird in Hand is the best thing I’ve written. It’s certainly my proudest accomplishment — probably even more so because it’s not an overnight success. 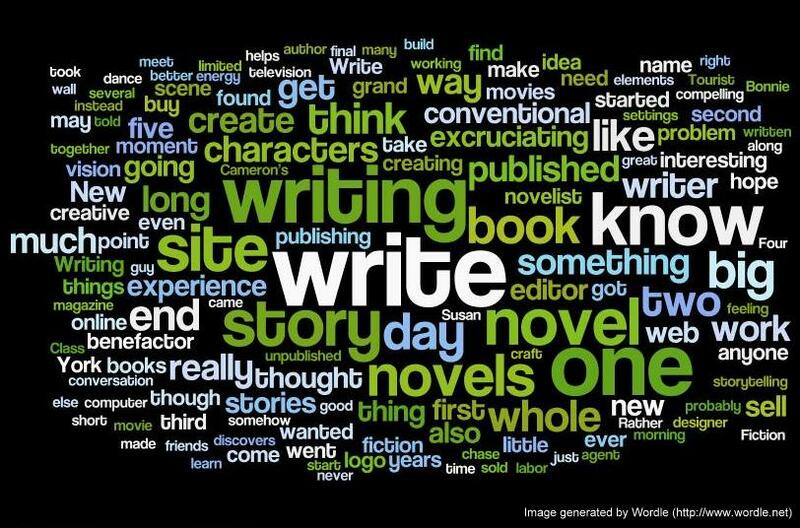 Writing and blogging and talking in interviews about my new novel this week, I keep encountering the same question: What inspired it? There are many answers to this, of course, and I’ve talked in different places about various sources for the story. But the deepest reasons are hard to articulate. So I decided to write about them here. It appeared to be a tragic accident. This woman entered the highway from an exit ramp, and, apparently disoriented, drove 1.7 miles before the crash. She’d called her brother from a rest stop an hour before, the papers said, complaining of fatigue and sounding confused. A police officer speculated that maybe she thought she was in the slow lane on the correct side of the road; others suggested that perhaps she was on prescription drugs that impaired her judgment. Or maybe she was exhausted from being on a camping trip with all of those children, or distracted by their bickering or crying. But as it turns out, the woman was drunk. Not just drunk — she was blind drunk, with twice the legal limit in her bloodstream and fresh alcohol in her stomach. A bottle of vodka was found in the car and she tested positive for marijuana. How could this happen? Specifically, how could this woman ingest alcohol and drugs, knowing that she was responsible for the lives of five children — not to mention any strangers who got in her path? Why didn’t she pull over? Her recklessness suggests that she may have been suicidal. But it’s one thing to take your own life, and quite another to put others at such appalling risk. And there are other questions: What did she actually say to her brother at the rest stop? Did he, or her husband, know she’d been drinking or smoking pot? Had there been an argument? Did she have a drinking problem; had she ever done anything like this before? These questions, prurient as they may be, matter to us because we want to make sense of the unthinkable. And I think they’re particularly resonant for mothers. This woman’s behavior at the furthest edges of comprehension. And yet every mother I know has feared her own capacity – through accident or neglect or worse – for doing harm to her child. When my first child was born I joined a group of new mothers, and we joked with the blackest of humor about exactly these fears. One woman said that late at night, lying in bed, waking nightmares would come unbidden about the things that she might do wrong: what if, what if, what if. Another read shaken-baby stories obsessively, worried about her own impatience and anger at her colicky child. Yet another admitted that post-partum depression had once rendered her apathetic and unresponsive, more concerned with her own needs than those of her (neglected) child. I admitted that I was terrified of getting in a car crash that was my own fault and being responsible for maiming, or killing, my child or – god forbid – someone else’s. This quiet terror propelled me into writing my new novel, Bird in Hand. I began to tell the story of a woman, a mother, who has several drinks and gets into an accident in which a child dies. As I started writing, though, I found that it was like staring directly into the sun; I had to squint and turn away. I put the manuscript in a drawer and only came back to it after several years, when my children were older and my own fears had subsided. And I changed the focus of the novel: the accident became a catalyst for the larger story rather than the story itself. Writing this book was a way of exploring my deepest fears around this subject. I wanted to follow my character through her grief and guilt to some place on the other side. In Sophocles’ Oedipus at Colonus, Antigone says, “Now the finish comes, and we know only in all that we have seen and done bewildering mystery.” I wasn’t looking for answers, only for a way to comprehend the mystery. Like Greek tragedy, the terrible accident last week goes straight to the darkest places within us. It makes manifest our deepest fears, vividly revealing what the unimaginable looks like. What if, what if, what if. I wrote about what I learned in the process of writing Bird in Hand — not about writing, but about life. You can read the post here. 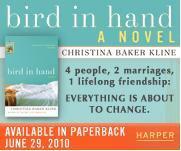 An extra incentive to click through: Lisa is giving away a copy of Bird in Hand in a random drawing. I know you already have it, but isn’t someone’s birthday coming up?